We believe in the untapped potential of every human being. Every person we help achieve that potential will bring us one step closer to achieving our potential. We believe our greatest assets are our team members. We treat them with respect and integrity, valuing the contribution they make to enrich the lives we touch. We believe in working as a team to achieve individual and collective goals. We believe in performing our services with servants' hearts, positive attitudes, and the effort of artisans. We believe in superior service to our clients and our community. We believe in acknowledging our blessings first and recognizing our challenges as opportunities for growth. We believe in team member development through continued education. We believe Scripture is our authoritative moral code. Our aim is to do what is right. We believe God put us on this Earth to have a relationship with Him and His creation...and to do all things which give Him the Glory. 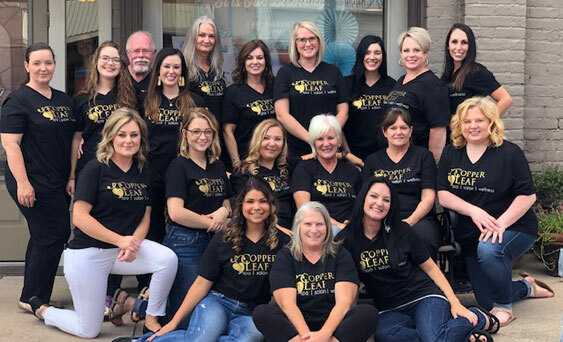 With over 5000 square feet of space, the Copper Leaf Day Spa and Salon of Winnsboro is truly an oasis. People come from all over to enjoy the level of technical experience we have along with the beautiful, peaceful environment.